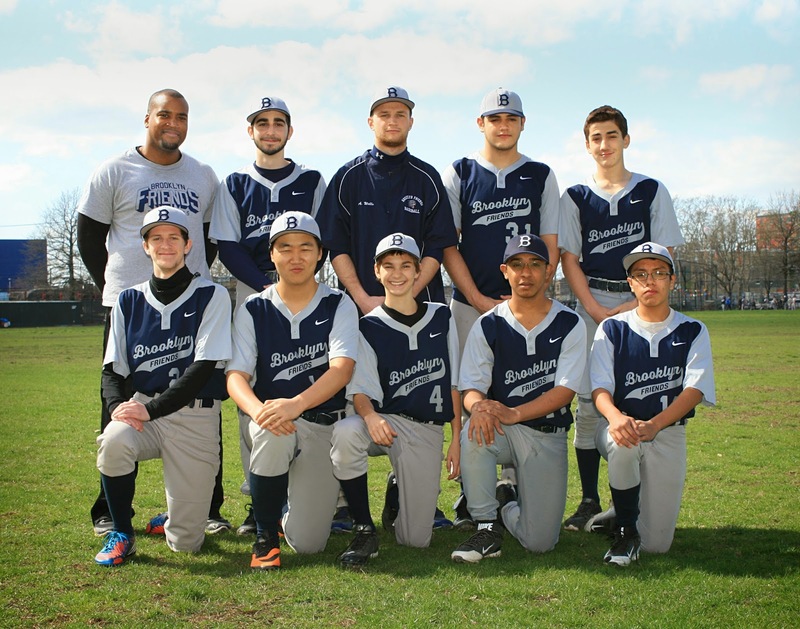 After what has been a very successful run for the boys varsity baseball team over the last decade and a half, the team entered the 2015 season in full rebuilding mode. The team entered the season with only a 12 man roster. The roster consisted of two seniors, three juniors, three sophomores, and four freshman. The team dropped their first five decisions of the season by a total of 55-11. Game number six told a different story however as they finally nailed down that first victory by defeating Garden School 22-5. The boys would go on to lose their next three straight by scores of 11-4, 7-2 and 11-3. It wasn’t until the end of the season that the team clinched their second win of the season in their last game of the season by once again defeating Garden, this time by a final score of 10-7. 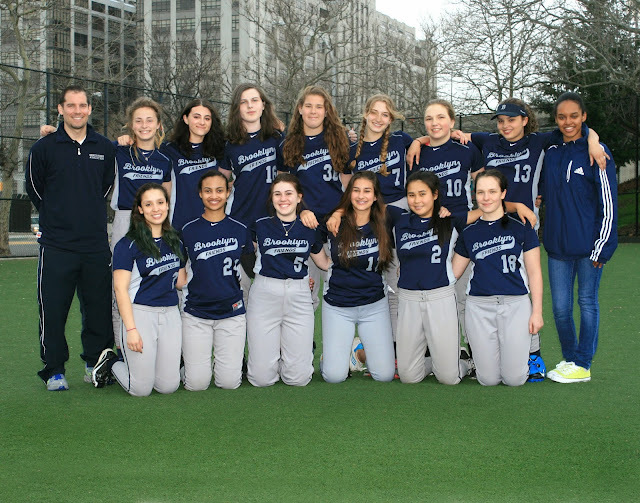 The Varsity Girls softball team had another successful season. The team finished with an overall record of 9-6 once again. The team had the same goal as in recent years. To make it to the league championship game. For the last three years the team has made it to the final game, coming up just a bit short. This season they wanted to make, but they also wanted to win it all. And win it all is what they did. The TEAM finished its ISAL regular season undefeated at 5-0. They faced Brooklyn rival Bay Ridge Prep in the semifinals and defeated them 16-5 down at Van Voorhies Field. Then they took on their arch nemesis LREI in another championship game battle. This was the third year in a row the two teams faced off. Last year LREI defeated BFS 5-2 in the final game. This year the team had different plans. These 1 girls really stepped up all season and improved each and every time they took the field. This team was anchored by it senior core of Julia B., Julia C., Maret S-M, Ariel G., Airenakhue O., and senior greta L. who joined this season. But everyone contributed in their own way to this wonderful season. The upperclassman were a vital part in the team’s success this year and during the last couple seasons. The seniors were once again our leaders with their help on and off the diamond. SeniorJulia B. played an extremely solid third base while batting clean up all season. She even took the mound a few times as well as played a little first base. She was true leader. She also caught the last ball during the final game for the record win. Senior Julia C. was one of the team’s catchers. And of course this is not an easy position to play but she really embraced her new position during the second half of last season and thrived in her role. She was also the teams best bunter. Senior Maret S-M. did a little of everything for our team. First off she bring a very unique positive energy that carries over to the rest of the team. She was basically a vacuum at second base scooping everything up and making almost all of the plays. She had an exceptional season as our lead off hitter, including two hits in the final game. Senior Ariel G. improved each season on and off the field. She came in as a freshman with a fantastic arm and this season played her position of shortstop to near perfection. During the final game she made a few big plays to help us secure the victory. She also had a key walk leading off a late inning during our final game and had an all around good season at the plate. Senior Aireankhue O. was a very reliable catcher during the season and played a solid outfield. She also improved at the dish including two key hits during the championship game, including her first one that got our first rally going. She scored two keys runs that helped us to victory. The “Core 5” that there are now known as were phenomenal all season and they will be missed dearly. ANd then there was senior Greta L. who just joined the team this season and with her hard work and solid effort became our regular left fielder. She made some key plays on defense and came up with some timely hits and walks, including an important RBI single during the final game driving in our first teams run. Next year the team will feature this years upcoming juniors and sophomores. Junior Taty R. is out pitcher. She improved as the season went on. She really found her groove during the playoffs as she pitched two complete games and racked up the strikeouts. She fields her position extremely well and she was also our number two hitter in the order leading the team in hits and RBI’s. She saved her best for last during the final game as she struckout 9 and only allowed 2 walks, while giving up only three runs. We could not have done it without her or anyone else on this TEAM. Junior Naya C. has been solid over the years on offense and defense. Next year she will need to step up on both and really be a team leader. We are hoping she can become possibly our everyday second base women and move up in the order and use her good eye at the plate to continue to rack up important walks. Junior Sarah G. will also be looked upon to step upas she will play more innings in the outfield and definitely accumulate more important at bats during the course of a season. The current sophomores were lead by Ivy L. who stepped in and basically played a flawless first base, while being one of our back up catchers at key points during the season. She also held down the fifth spot in the batting order playing in every game. She along with fellow sophomore Silvely A. who was new to the school, program, and team will be looked to add leadership and experience to our team next season. Silvely jumped right in and fit it well with our team. She is a tremendous athlete.She was our back up shortstop and played an awesome outfield which including throwing out two runners from centerfield at first base during a late game at Staten Island Academy against and undefeated team. She also played in every game and batted in the three whole all season. Sophie E., and W. have some big shoes to fill but we do expect great things from these three key sophomores who will definitely get more playing time and will need to contribute for the team to be successful and keep this run going. We think they are ready for the challenge. Our freshmen Fiona B. who played on the team last year will be called upon to do so much more next year and Rosemary D-C who was new to BFS and new to BFS Athletics this spring. Fiona has learned a lot and I think she is ready to jump in. She did a great job during the second half of this season. Rosemary was great. From the first day she joined she was a key member of the teams overall success. She improved each and every minute and actually ended up being our starting right fielder and second leadoff hitter batting in the tenth spot in the order. She made a great catch midway through the season in right field, followed by snagging her first liner drive in her first chance at third base as we needed her to play that position for an inning. Next year will be a big year for her as well. As the season progressed our team got better and better. The girls were truly a pleasure to coach. We lost our first game against a really good team but played them extremely well. Then we went on a four game winning streak and you could see the confidence building. Then we won some and lost some against some good teams as we geared up for our last regular season a game and another ISAL Playoff Run. We defeated Garden 21-4 and finished up the regular season undefeated in our league. We headed into the ISAL Playoffs for the fourth year in a row on a winning note. We won our league semifinal game and then played one of the best games ever in the championship. The fans who attended were really treated to some quality softball by both teams. This year’s team was comprised of six seniors (Julia B., Julia C., Maret S-M, Ariel G., Airenakhue O., and Greta L.), three juniors (Taty R., Naya C., Sarah G.), four sophomores (Ivy L., Silvely A., Sophie E., Anna W.), and two freshmen (Fiona B. and Rosemary D-C). We need more girls to join the team next year. Blue Pride Runs Deep, Friends Forever!! The three juniors, five sophomores, and one freshmen will be expected to make huge contributions next year as we lose this phenomenal senior class. Through continued hard work and dedication this new team will with out a doubt have great success in the future on and off the field. This team full of young talent has a bright future ahead of them and we look to continue the storied tradition. We all look forward to more excitement out on the diamond. Blue Pride Runs Deep, Friends Forever!! After two years of low participation numbers, the 2015 Middle School Baseball team was finally back at full strength. The season started with the team losing two of their first three games to Browning and Friends Seminary, with a victory against Berkeley Carroll in the middle. After a 1-2 start, the team turned it on where they went 6-1 the rest of the way, finishing with a record of 7-3. Victories came against Staten Island Academy, Lycee Francais de New York, Bay Ridge Prep, UNIS, Packer, and the second meeting against Friends Seminary. They played a very competitive game, but came up short in their only other defeat of the year against Saint Ann’s. The middle school offense, which started out slowly, picked up after the third game. 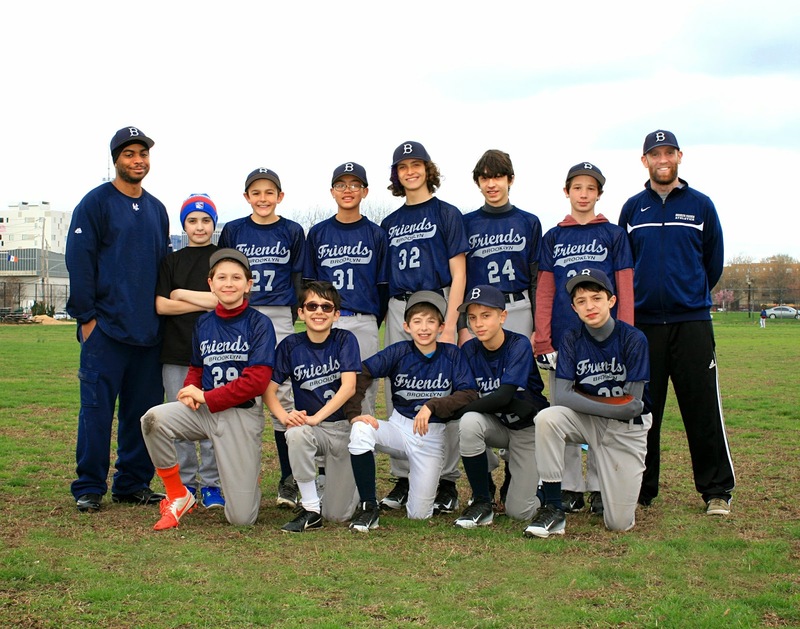 On the season, the Middle School Baseball team outscored opponents 93-34. This young team comprised of 10 seventh graders and one eighth grader improved and played fundamentally sound baseball as the season progressed. Jack B. not only did a great job playing third base, he also came on mid season to be a dominant pitcher. Jack led BFS pitching with a 3-0 record and averaged about 11 strikeouts per game. Finn S. did a great job playing first base and also gave quality starting pitching performances from the mound. Gabe D. rounded out the starting pitching rotation with solid performances and the nerves and will to pitch out of tight situations. Ty S. was a force behind the plate catching every game and making oppositions think twice before trying to steal bases. Offensively the team struggled during the first few games, but some closer attention to hitting during practice and live pitching repetition turned them into an offensive juggernaut. As a team patience at the plate was preached, and they showed discipline averaging eight walks per game. This led into big offensive innings, and lots of runs on the board. The offense was led by Aja M. who became a beast at the plate with four home runs on the season. Ty S., Finn S, and Lewis W. also provided timely hitting at the top of the lineup, while the lead off man Coby W. used his height to shrink the strike zone and see many walks which got the inning started. While most lineups weaken down the line, all ten batters were able to come through in spots throughout the season. Jack B. used his speed to get on base and beat out ground balls. Brothers Gabe and Patrick D. caught pitchers off guard with their skill in the seventh and eighth spot in the lineup. Ben R., Ryan B-H., and Ethan K-L all had a beneficial hit or walk at some point this season to round out the bottom of the batting order. This young team showed tremendous heart and joy while playing the game of baseball. As always, they did a great job as ambassadors and student-athletes representing Brooklyn Friends School. Blue Pride! The 2015 Middle School Softball team started in March for the first time in several seasons; an accomplishment in itself. The girls immediate commitment and fun attitude set the foundation for a challenging, yet rewarding season. The Panthers softball team improved every day and this was evidenced by our two best games happening at the end of the season. It was a pleasure to watch the team support each other and learn as they played. When in practice, the team wanted to constantly improve and get a specific play right. In games, the girls embraced learning to steal, what base to throw to, and develop their eye at the plate. Our pitchers worked very hard to pitch strikes; a very difficult task for never pitching before! Our last game was a close game throughout the first five innings against Friends Seminary. Even though the outcome wasn’t what we wanted, it was rewarding to see how far we’d come from playing them in the start of the season. 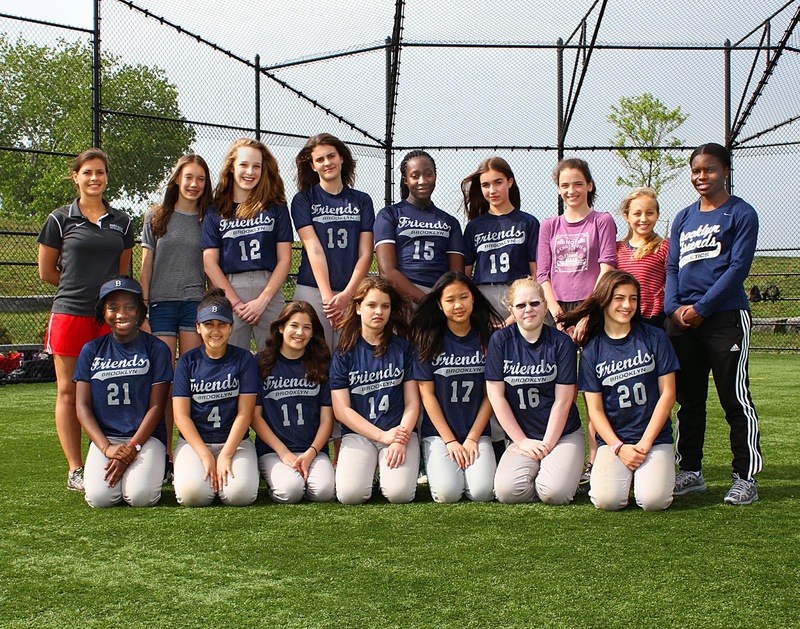 This season saw eighth grader Devon O. and seventh graders Salma M. and Libby S. to the mound. None had pitched before and all gave admirable efforts. All three developed speed and when they pitched strikes, very few players could hit their pitching. Walks hurt the team, but as seen in our last game, when we did not walk batters we were great defensively! Additionally, these three stayed in the middle of our lineup and scored many of our runs. Libby and Salma also shared first base and Devon caught when she wasn’t pitching. Catcher Anique played her hardest each game and was a great team player. Her attitude and commitment to showing up to every practice also proved she was a valuable member of the team. Milly B. and Sylvie B. held down our middle infield; playing second and short stop. Both girls were very reliable; a ball hit to them was almost always an out. Kaley B., Salma M., and Charice L split time at third base. All three made some athletic plays and catches that greatly impacted outcomes of games. Nova S., Jessie R., and Salma B. covered the outfield as well as played in the infield. They all gobbled up fly balls and consistently got on base while batting. A huge shout out to our managers Nora, Elsie, and Willa who helped organize equipment, infused positivity, and were just fun to be around. Even though the team was young, it has such potential for a stand out season next year. It was a pleasure to coach them with Coach Jasmin. They are truly a special group of young women. Remember, play hard, play smart, play together! Brooklyn Friends track and field team did a great job of developing their team in the spring 2015 season. With the exception of seniors Giovanna Molina and Maya Kaul, the team were all first year runners. The strong leadership of Giovanna and Maya helped develop a strong work ethic among the team that carried them throughout the season. This year the team competed in the ISAL league with the bulk of the meets taking place at Red Hook track. At the Churchill meet, Malik D. showed his speed running 13.02 in the 100M and following that performance up with a 26.18 in the 200M race which was good for 8th place out of 27 runners. At the same meet the twins Ben F. and Sam F. placed 2nd in their respective heats in the 200M. Two is their lucky number. Miranda C. showed her grit and determination at the Churchill meet running the 800M race in her first outdoor track meet. She placed 7th out of 11 runners. Her dedication, drive, and enthusiasm for running is contagious. She has been a real inspiration for her team. This year we had several runners practice with the team, however other commitments kept them from remaining with the team. This team built a strong foundation that will carry them to success in future seasons. 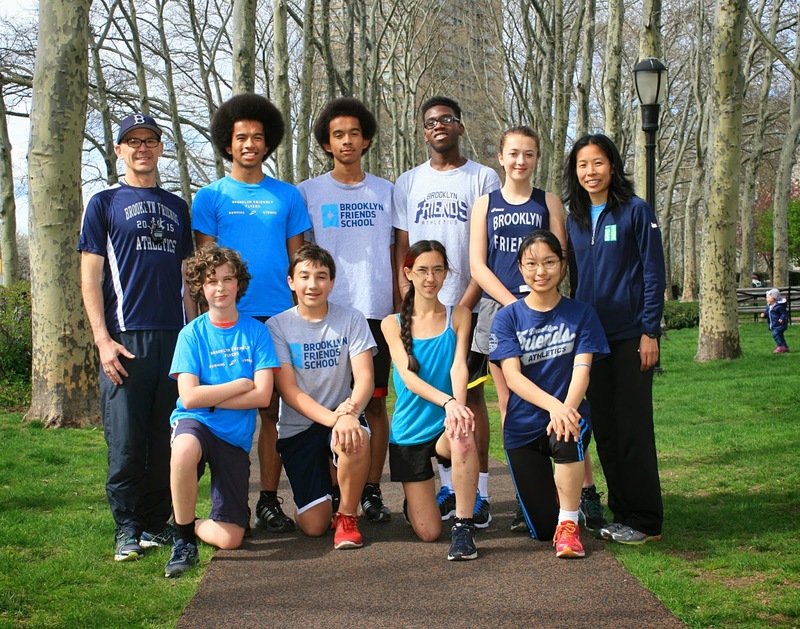 The middle school boys track team had two runners committed to being on the team. This year Oscar D. and Sydney E. never missed a practice. They worked hard and enjoyed training and learning from their upper school teammates. Sydney showed his commitment to the team by being one of three who competed at a meet in Van Cordlandt Park. Oscar ran in his first outdoor track meet at the Churchill Meet at Red Hook track. He showed his grit and determination in the 800M race and learned a great deal about pacing and reserves. The season can best be described as a developmental season in which these two runners laid down a strong foundation that will help propel them into future seasons. We’re looking forward to seeing them carry this experience into successful future seasons. The BFS Boys Varsity Volleyball Team had another successful season, this time as part of the newly created ACIS boys volleyball league. The team completed the regular season undefeated, to earn a 1st place seed in the playoffs. The team made history by winning all regular season matches 3-0, for a total of 15 matches in a row, and 45 straight sets, including a few non-league matches. During the ACIS playoffs, after defeating Berkeley Carroll 3-0 in the semifinals, the team lost senior leader Thomas C. to an unfortunate ankle injury. The team still went on to compete hard and show its pride before coming up a little and losing the Championship match 0-3 to a strong and competitive Packer Team. “We’ll Be Back!” The team played hard and determined throughout the season, remaining calmed, focused, and confident under the pressures of the historic season. It was a great growing experience for our student-athletes. Special thanks to assistant Coach Edson Elcock for his great coaching job, our team managers Fiona, Abby, and Ashley for their constant support, and to our players, seniors Thomas C., Lucas M., Griffin E., Julien B., and Tyler V., Chris B., Kamal G., Philip C., and Ernest M. for always playing their hearts out and representing the school with great pride and determination! Everyone contributed to the great success and to the growth of this sport at BFS and in the private schools sector. 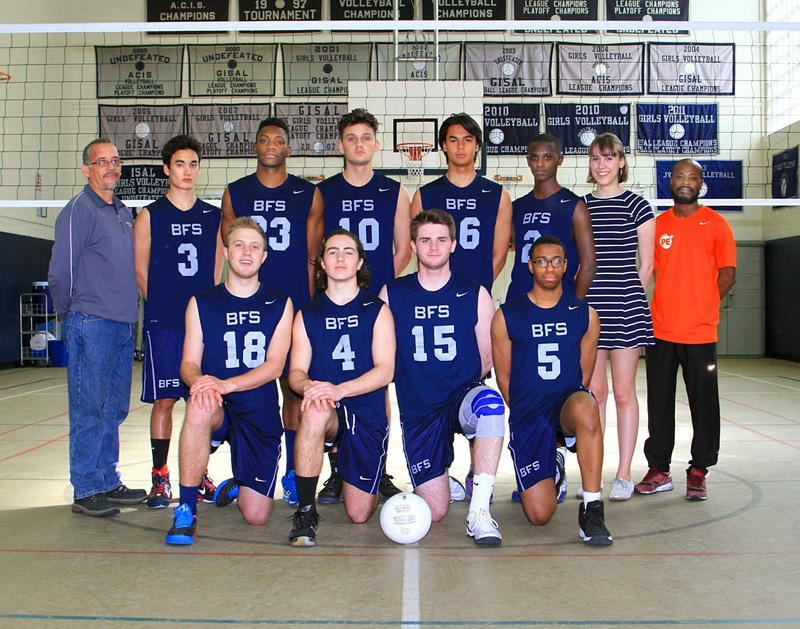 The future looks bright for our boys volleyball team. What a magical season and experience. Blue Pride….